On Wednesday, 30th May 2018, a 24-hour Pan-Hellenic strike took place in Greece. The struggle for the organization of this strike was particularly tough, since the compromised leaderships of the GSEE-ADEDY confederations, although they called a strike, did everything for its failure. Thus, the compromised trade union leadership of GSEE and ADEDY called upon workers to demonstrate and strike for "boosting entrepreneurship and innovation", i.e. to demonstrate for the demands and context of the OECD, the IMF, the EU, the ECB, the Memoranda and the Government. And they called this a "national plan"! In contrast to the compromised leaderships, the class-oriented trade unions, rallying around PAME, have put forward a framework of demands and claims which bringsthe needs of the workers and their familiesto the forefront, they take a stand against employers and governments. The latter, in the name of supporting business profits and competitiveness, intensifies the attack on the working class. • Increases in wages, pensions, social benefits. • Abolition of all anti-labour and anti-people laws and the 3 memoranda. • Restoration, obligingness of the Collective Agreements, no one below 751 euros. • Legislative regulation of the Sunday holiday. • No to the auctioning of the first property. • Down with the taxes – the big capital should pay them. • Abolition ofthe ENFIA tax and heavy taxation. • Abolition of the laws that hit Social Security and cut down pensions, such as Katrougalos’ Law. • Recruitments in public hospitals and schools, permanent full-time teachers and health professionals of all specialties. 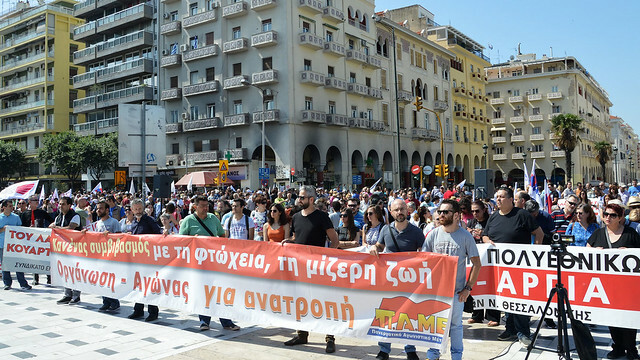 In Athens, thousands of workers, unemployed, youth and retired people participated to the demonstration of PAME, under the slogan: "Your growth is crashing our lives! Struggle, organization and counter-attack is our choice! ".With this mass demonstration in Syntagma Square , outside the Parliament, under this slogan, strikers from dozens of sectors responded to the government and business group's "growth plans", as well as to the forces of employer-led and government trade unions that want to put the workers behind the "national goals" of the monopolies. "No more modern slavery, the workersdemand permanent work", "No to consensus and submission, disobedience and class struggle", the strikers shouted out loud. Speaking at the strike gathering in Athens, GiannisTassioulas, member of the Executive Secretariat of PAME and president of the largest sectoral federation of the country, the Federation of Construction workersof Greece, noted among other things: "The government has acquired the talent of turning black into white on behalf of the capital. The capital, the government, the bourgeois parties and their forces within the labour movement will find us facing them all. The government's fairy tale about the "fair" growth, the "end of the memoranda," about "returning to regularity" cannot even fool a young child. What kind of "fair" growth is this, with hundreds of anti-labour laws in full force and permanent for many decades to come? What kind of "fair" growth is this, which is accompanied with the privatization of ports, airports, lignite units? With these privatizationswill workers have better wages, better working relations? Will workers’ - popular families pay cheaper plane or ship tickets? Because of the fact that the government is also trying to fool us about the privatization of the "utilization of public property", does not mean that the workers, the poor people, will benefit. We will pay more, we will work more cheaply in order for the big businessmen and the so-called big investors to fill their treasuries. What "regularity" and "return" are they talking about? Will they make up for the losses we had? Will pensions, retirement age limits come back? Will we get rid of ENFIA and heavy taxation? ". As G. Tassioulashighlightened: "There is a potential for our families to be able to live better, meet their needs, and move our lives to a real higher level. All the wealth passes through our hands, with our work we build giant buildings, bridges, factories, we produce everything and we are condemned to live in poverty and tolerance. We do not compromise with the present and the future that the governments, the parties and the forces of the capital are planning for us. We will fight to the end. This is for sure. This is encouraging. ". It should be noted that in all PAME demonstrations the speakers condemned the participation of the Greek government to the imperialist interventions and wars, and they also criticized the trade union forces which align with the so-called "social consensus" and in practice sabotage labour struggles and demands. The GS of the CC of the KKE DimitrisKoutsoubas attended the PAME strike gathering in Athens, where he made the following statement: "No illusions. The anti-popular attack will continue. SYRIZA and ND are trying to hide their strategic alignment through fake confrontations, through false promises. The workers' - popular movement must now be regrouped so that it will take the case in its own hands, with a strongKKE ".